Can be divided loosely into four types, under two headings - "classic" and "woolly". 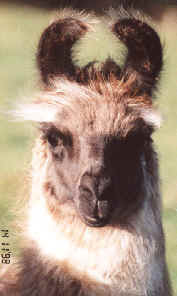 "Classic" llamas can be sub-divided into short-woolled (Ccara) and medium-woolled (Curaca), although the medium-woolled Curaca is often included as Ccara. Ccara and Curaca have a short or medium coat on their bodies with very short, close cropped hair on the head and down the legs, especially below the knee. They sometimes lose the longer wool on their necks too when they mature, leaving their necks with dense but short soft wool. "Woolly" llamas can be divided into heavy-coated llamas (Tapada) which have a heavy coat on their body but little wool on the head or below the knee, and heavy-coated llamas (Lanuda) that also have lots of fringe wool on the head and whose legs are woolly right down toward the ankles. Terminology such as as Ccara, Tapada etc, varies depending on the ethnic languages of South America. Those given above, for example, are Quechuan terms used in much of Peru. In the Aymara language, used in Bolivia and South Peru, heavy woolled llamas are all referred to as "Tampuli". 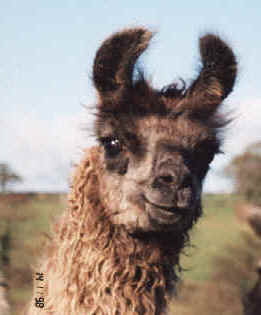 The Ccara is the type of llama most often seen in the UK, but "classic" as a description is something of a misnomer. Before recent imports from South America, most llamas in Europe (and North America) came from Ccara stock imported from Peru in the late 19th and early 20th centuries! And because these were the only llamas known in Europe, they were regarded as typical - the llama phenotype, or the "classic llama". In actual fact nearly 70% of the world's llamas reside in Bolivia and it is estimated that about 80% of Bolivian llamas are medium or long-woolled. Even in Peru only 50% are the so-called "classic" short-woolled llama. In the UK, Tapadas and especially Lanudas are still rare but they are a speciality at Roseland and as the llama types page show, we have some wonderful examples of the "woollies"
Llamas can be described as pony sized although much lighter in build, weighing circa 120-150kg. In South America the average llama is about 38" at the withers but if you were to take a young cria (calf) from South America and grow it in the UK it would be likely to put on an extra 2 to 4 inches due to the more nutritious diet. are not just white as many people believe, but come in a great variety of colours from white to black with many shades of brown and grey in between. 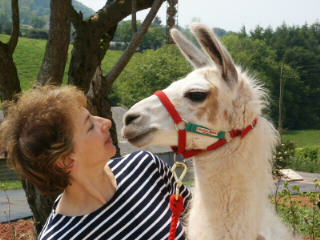 It is said that there are some 35 natural shades of llama wool and our hobby at Roseland is trying to breed them all! do not have hooves. Each foot has two toes with soft pads. The toe nails may need an occasional trim but usually wear down naturally. can be sheared annually or, more usually, every two years. Importantly, however, they need not be sheared at all if you do not wish to harvest the fibre, as it stops growing at a manageable length. have very soft, light and warm fibre which is described as alpaca if its micron count (thickness) is measured as 28 microns or under. It can usually be sold at a good price. are very hardy, having flourished for thousands of years on a sparse diet in a climate where it can be freezing before sunrise and over 100F by midday. do not have to be exercised, nor do they need to be housed at night or in winter (although a field shelter or stable is desirable and useful). calve easily, rarely requiring human intervention. eat less than sheep, cattle etc, on a weight ratio basis. do not need annual dipping as with sheep. are relatively resistant to most diseases found in European livestock. Although originating in South America, they do not suffer from any unusual or 'exotic' problems specific to llamas or that region. They have high resistance to foot-and-mouth disease and many believe they cannot contract it naturally. (The UK foot-and-mouth epidemic of 2001). Ccara trekking llama Dooby (on the right!). A Roseland lanuda female llama with eye lashes and eyebrows to die for! Another young Roseland lanuda female who has curly or "suri" type fibre. Grass is the staple diet of llamas, although they will nibble on fresh hedge and tree shoots etc. They are not goat-like, however, in that they will not stay to strip a tree. Hay can be given ad lib, especially when grass is in short supply, or conversely, very lush. A small amount of "concentrates" such as a goat mix or pony mix can also be given as a treat and to bring the llama/s to hand. Over-feeding should be avoided. Standard stock fencing is adequate in most situations, although higher fencing may be required if you plan to keep more than one breeding group or, for example, the field fronts a busy road. Barbed wire should be avoided.